Spec. Hayden Harnek, left, mans a M240B machine gun while Spc. Josh Rowe helps with aiming at a defensive position during a rotation at the Joint Readiness Training Center at Fort Polk, La., Feb. 15, 2018. The proposed fiscal year 2020 budget shifted funds to support 32 CTC rotations, including ones at JRTC and other training centers. At $182.3 billion, the proposed fiscal year 2020 budget shifted funds to support 32 CTC rotations, four of which will go to National Guard units — twice as many as in recent years. “It’s now, I like to say, the longest and toughest in the world,” said Army Secretary Mark T. Esper about infantry OSUT while testifying before the House Appropriations Committee’s defense subcommittee on Capitol Hill. “We’re looking at some adjustments based on what the National Defense Strategy tells us to do to make sure we are in locations that allow us the highest degree of readiness should a conflict happen,” Esper said. “With continued, consistent, predictable Congressional support, we can reach those levels of readiness,” said Army Chief of Staff Gen. Mark A. Milley. 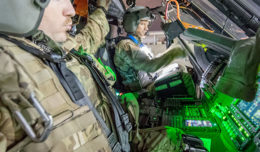 Much of the budget is geared toward the Army’s six modernization priorities after senior leaders freed up $30 billion over five years from nearly 200 legacy programs. “In short, this budget will increase the Army’s lethality in the near term and set conditions for increased lethality of the Army in the future,” Milley said. The top modernization priority — Long-Range Precision Fires — is heavily focused on to reclaim overmatch against near-peer competitors. Army Chief of Staff Gen. Mark A. Milley, center, speaks with Spc. 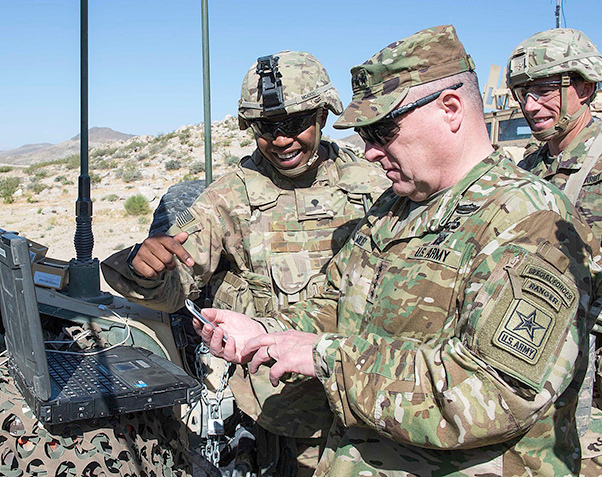 Steve McAdoo of the 780th Military Intelligence Brigade about cyber tools during a rotation at the National Training Center at Fort Irwin, Calif., May 9, 2017. The proposed fiscal year 2020 budget shifted funds to support 32 CTC rotations, including several at NTC and other training centers. 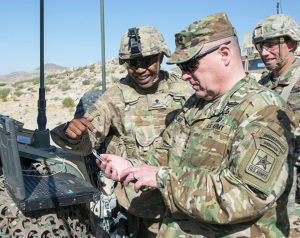 To speed up the time it takes to get new technology in Soldiers’ hands, the Army is moving from an industrial-based model to one that is more tailored to its needs. Last summer, the Army Futures Command was stood up as part of the Army’s largest reorganization in decades to oversee modernization efforts. 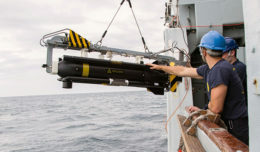 The command’s cross-functional teams are now streamlining an outdated acquisition process to quickly procure new gear. 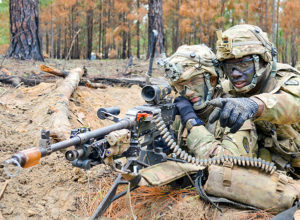 An example of how the Army may buy equipment in the future is the next-generation squad weapon. Only about 100,000 of those rifles — enough for roughly 10 percent of the total force — will initially be purchased for Soldiers who engage in close-quarters combat, Milley said.